With countries around the world agreeing to the United Nations 17 Sustainable Development Goals (SDGs) for 2030, the world is moving forward from the industrial era to the sustainable era. In 2015, global leaders agreed to adopt the SDGs with the aim of transforming our world by 2030. The Paris agreement was ratified by 198 countries including Sri Lanka at the summit of the United Nations Framework convention on Climate change. The government from March 31 to April 4 will launch the programme “Thirasara Lanka (Sustain Lanka)” at the BMICH to bring together all stakeholders in the country in order to find and showcase ways in which these goals can be adopted into the Sri Lankan context. 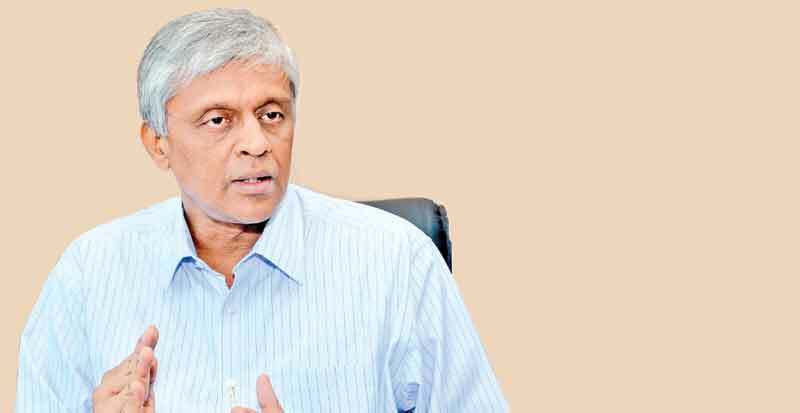 Chairman of the Strategic Enterprises Development Agency (SEMA) Asoka Abeygunawardena who is in charge of the programme, in an interview with the Daily News explained what it was all about. Q: What are the programmes SEMA is currently working on? A: Earlier, SEMA focused on the development of state owned enterprises. It was formed by former President Chandrika Bandaranaike Kumarathunga to ensure that state owned strategical enterprises are not privatized while not being a burden to the country at the same time, as most of these institutions were running at a loss. It also develops strategies to improve the performances of state owned enterprises and currently there are 20 state owned enterprises under SEMA. But, President Maithripala Sirisena instructed us to concentrate on sector wise issues as well. Currently, we are implementing two major projects related to agriculture. Last year, SEMA formulated a three year national programme covering 10 sectors to strengthen organic farming methods without the use of pesticides and chemicals. Last year, we conducted training programmes and mobilized farmers for it. During the 2016 Maha Season, we worked with 7,500 paddy farmers covering 10,000 acres, and now the harvesting of these fields are taking place. We have proved that there is no additional cost involved in organic farming. The harvest is the same or sometimes more, when using organic farming. We are mainly streaming it, other farmers too would be involved in this endeavour. This is a three year programme, our aim is to label Sri Lankan food products as “if its Sri Lankan it’s toxin free”, and we can also target high end markets worldwide. At present, the contribution from agriculture to GDP has dropped to about 10 percent from 30 to 40 percent which means that the agricultural economy is collapsing and as a result we witnessed that poor females in those villages had to go to the Middle East to earn an income. With this intervention, they could come and work in their own paddy fields. Q: What measures have been taken to incorporate the SDG’s to all these sectors? A: The target for toxin free food is very important as the United Nations has declared that we will be moving towards a sustainable era from the industrial era. In 2015, the UN announced the SDG’s covering 17 areas. We mainly cover sustainable agriculture and food but that will in the long run, address many of the issues pertaining to poverty. What we have done covers a major sustainable development goal. This is a paradigm shift. During the industrial period, we were talking about using more chemicals, widening the road, having more vehicles and having high rise buildings. But under SDGs we talk of the opposite; our focus is not only on economic growth but how satisfied the people truly are. It’s not only focused on consumerism. Climate change is also another reason why we need to focus on SDGs. Global carbon dioxide concentrations have increased by 50 percent, the global average temperature has increased by 1 degree and sea level raise has risen to 20cm. As a result, the world had to face many disasters. This shift has changed everything, our agricultural practices cannot survive. President Sirisena at the beginning of this year clearly stated that we are marching towards a sustainable era and appointed an expert committee to come up with ideas and suggestions which sets not only 2030 targets, but also the 2020 targets. The present government is also setting its own targets to be achieved by 2020. Q: What is the “Thirasara Lanka (Sustain Lanka)’ programme about? A: It is a combined effort by state agencies, private firms, small scale entrepreneurs, non-governmental organizations, community based organizations, co-operative societies, scientists, creative artists, researchers, inventors, media personnel, school children, youth, farmer communities and consumers to Sustain Sri Lanka (Thirasara Lanka). In January 2017, the government of Sri Lanka launched the “Sustainable Era” initiative and the year 2017 was declared as the year for eradicating poverty. These steps were taken to move Sri Lanka into a sustainable future. The “sustainable Lanka”, education and trade fair organized by the Presidential Secretariat along with the Strategic Enterprise Management Agency, aiming to create awareness over various facets of a sustainable country among the general public. The event is scheduled to be held at the BMICH from March 31 to April 4, 2017. During this five day period, we expect approximately one million participants with whom we could share knowledge, raise awareness, provide training, exchange success stories on achieving sustainability and come to a common understanding on how we can achieve sustainability together. We believe that this event would also provide a unique opportunity for the private sector to contribute to a national level discussion on the different sustainable developmental agendas in relation to their own business interests. All 17 SDGs will be divided into five days for which we will be having major rallies. There will be another 80 events which will run parallel to the main one, covering all the SDGs. The 17th goal (Partnerships for the Goals - Strengthen the means of implementation and revitalize the global partnership for sustainable development) clearly states that this cannot be achieved only by the state but should be done with the partnership of all institutions, private sector and the people. This event will be a gathering of all the sector leaders and discussions will be held on how to develop partnership and work collectively to achieve the targets. Q: What are the major events that are to take place? A: This is an initiative that will determine the future of Sri Lanka. The community is still in the industrial era where they have consumerism oriented practices. Their mind set need to be changed. The UN highlighted to focus on the economic, social and environment sector but in Sri Lanka we have added another and that is the spiritual side. Visitors will get the chance to buy toxin free food at affordable prices at the Avurudu fair. There will be green products from local industries, sales stalls, industrial stalls, health clinics, toxin –free cookery demonstrations, nutrition programmes, green job fairs, green entrepreneurship chain, women and children – counselling services, educational exhibition stalls, presentation of research papers, innovations demonstrations, creative contests, discussions, debates, Janakala, cinematic creations, Art circle and art meet, farmer’s meet, consumer voice, relief for consumer complaints, home garden network, renewable energy and energy conservation, physical health programmes, intellectual discourses and media zones. There are 57 regulators to safeguard the rights of the consumers but people are not aware of them. There will be a separate place, where consumers can come up with their complaints and representatives from all sectors will be present to help them out. There should be a mechanism in between to facilitate both the consumers and the regulators and with the Presidential Secretariat we are facilitating a programme to establish a national consumer network. It will be an independent institution where non-governmental organizations, trade unions and farmers organizations will be a part and that will help the consumers to contact the regulators. There will be 1,000 stalls and in addition, we need to have a different approach. The organizers and the visitors also should adhere to sustainable principles. This will create a new culture. People should visit this to have a clear idea about the SDGs. Q: SDG’s are always interconnected. What is the support extended by the other institutions for this? A: There will be 250 private sector stalls and more than 500 stalls from strategic enterprises. All ministries and institutions are currently studying ways in which we can incorporate SDGs to our programmes. They are participating in it in a positive manner. They are also prepared to have discussions. For example, during the Thirasara Lanka five day programme; the first day will be about the ‘quality of life’ focusing on good health and well-being, gender equality and quality of education. The second day will be about sustainable livelihoods focusing on elimination of poverty, decent work, economic growth, industry innovation and infrastructure. Third day will be about a space for the environment focusing on zero hunger, clean water, sanitation, climate action, life on land and life below water. The fourth day will be about responsible consumption and production, affordable and clean water and partnerships for the goals. The fifth day will be about reducing inequality, sustainable cities and communities, peace justice and strong institutions. The targets cannot be achieved in isolation; the SDGs are also very well interconnected and dependent on each other. Q: Are you doing enough to achieve all of the SDGs? A: The goals cannot be prioritized in order; all should be done at the same time. But practically, each country will have their priority areas. As we are not a fully industrialized country, we are in a better footing to move towards to a sustainable era. The government has identified four key themes that can be utilized; they are bio diversity, renewable energy and capable human resources. The people have the potential to move towards a sustainable era considering the nature of our country. Achieving these goals and targets require the combined efforts of various stakeholders through multiple partnerships to ensure that no one gets left behind. I think Sri Lanka is making progress. SEMA needs to broaden its scope gradually as many SOEs are becoming a burden to the taxpayers annually. As stated by late Dr.Stephen Covey re the "Seven Habits of Highly Effective People,"all infrastructure development activities "Must Begin With End in Mind". That is, all assets created must be effective for the welfare and economy of the state. Otherwise, it is wise not to start any of them. We have seen airports, ports, huge buildings, playgrounds and sports stadiums, hospital buildings and bridges have been constructed at massive cost and their effectiveness to the economy is zero. This is chiefly due to aimlessness of investments. Whenever we utilize the tax payers money, there should be the considerable relief to those taxpayers. So, the assets created must be made to be operational at the highest possible efficiency on completion of execution of construction works. As such, the SEMA should take measures to ensure the effectiveness of the SOEs by monitoring and facilitating. SEMA could have another section to deal with such action if it deemed necessary. Also, the real meaning of sustainable development must be properly understood by the SEMA. In order to ensure sustainable use of assets created, there must be continuing watchfulness by entrusting the assets to suitable "Caretakers" as our ancient Kings and later British administers did. Without these measures, it would be extremely difficult to ensure sustainability. So, SEMA must provide proper guidelines and monitor implementation of such measures without any exception.